In an effort to save Spock (Zachary Quinto) from certain doom, Kirk (Chris Pine) breaks the Prime Directive, a move that finds him removed from the captain's chair of the Enterprise. When a terrorist attack hits London, Starfleet Admiral Alexander Marcus (Peter Weller) orders a vigorous investigation, coming across the identity of John Harrison (Benedict Cumberbatch), an enigmatic, curiously unbreakable officer hell bent on disrupting the military plans of the peacekeeping organization. Restored to duty with specific orders to confront Harrison in Klingon territory, Kirk discovers the extent of the cold-blooded killer's plans, putting his beloved crew, including Uhura (Zoe Saldana), Scotty (Simon Pegg) McCoy (Karl Urban), Chekov (Anton Yelchin), and Sulu (John Cho), in the line of fire, while a new member of the team, Carol (Alice Eve), holds important answers to a stockpile of superweapons Marcus has ordered Kirk to use on Harrison before the resolute fiend has a chance to strike again. "Star Trek Into Darkness" takes the all-important first sequel position, a crucial step for any sci-fi franchise looking to prove itself worthy of long-term adoration. It's not an easy place to be for Abrams, tasked with advancing a beautiful reworking of known elements, deepening appreciation for the characters while establishing a prime villain aching for screen dissection. There must also be a substantial dose of familiarity, time with old friends, and the follow-up conquers this trial wonderfully, returning fans to the sputtery courageousness of the Enterprise crew. Having barely survived their first adventure together, the band must endure a new round of separation to stir up the suspense, finding Scotty resigning his position as engineer after an argument with Kirk over the new photon torpedoes being loaded onto his beloved ship, while Spock and Uhura are experiencing some turbulence in their secretive relationship, with the captain caught in the middle of their quarrel concerning the precious nature of the Vulcan's life. "Star Trek Into Darkness" also provides new levels of responsibility for Sulu, offered a brief moment in the captain's chair, while Chekov is pushed into the belly of the beast, taking over as engineer to the best of his ability. As for McCoy, he's as cantankerous as ever (my goodness, does Urban ever own this role), though his mood is lightened some by Carol's presence. The crew dynamic is alive and well in the sequel, supplying satisfactory banter that plays up personality divides and, in the case of Spock, persistent questions of logic. Despite its falling-anvil title, "Star Trek Into Darkness" retains a spring in its step, teeming with chaotic chases and zooming starships, boosted by immensely colorful, sharp cinematography by Dan Mindel and supportive scoring by the great Michael Giacchino -- though musically the movie doesn't invest in euphoric themes as much as before. Abrams is terrific with action, showing off the dangers of space jumps and cautious shuttle landings in Klingon territory, and the film culminates with a doozy of a sequence that finds the Enterprise spinning out of control, with Kirk and Scotty forced to navigate disorienting changes in gravity to restore stability to their home ship. "Star Trek Into Darkness" looks and sounds amazing, continuing exactly where the 2009 effort left off while cooking up new visuals that show off bustling cities and new starship tech, upping the intensity of the feature with unusual episodes of peril and dynamic CGI movement. Thespian charisma also returns in full, watching Pine approach the swagger and maturation of Kirk in unpredicted ways. Although he remains an impulsive captain and a habitual womanizer, Kirk is forced to develop a feel for protection in the sequel, realizing his crew has become a family unit of sorts, worth risk and recklessness to protect. Also engaging is Quinto, sustaining the potency of his perfect casting as Spock, a composed character pushed to the edge of his half-humanity in "Star Trek Into Darkness," revealing fresh dimensions of emotion and courage. Crew interplay is unbeatable, always triumphing over hiccups in the story, which become more intense as Harrison's modus operandi is exposed in full. Cumberbatch is merely serviceable in the role (perhaps too mannered), and there's been a lot of debate lately online as to whether the particular plot twist revolving around Cumberbatch's character was the right one. Quite frankly, without getting into yet another lengthy breakdown of the wrong's and rights of this film, I'll put it simply, I enjoyed this film. Was Harrison's plot twist necessary? Perhaps not. Did I still enjoy the film all the way through? Absolutely and I'd watch it again without hesitation. "Star Trek Into Darkness" does retain its intended sensation of high-flying adventure, while exploring terrorism's true source. The movie keeps its head above water by focusing on a swift pace and marvelous sequences of teamwork, clutching that precious feeling of breathtaking escapism that came so easily to Abrams four years ago. For a loyal trek fan who has waited for someone to come along and breathe new life into this franchise, "Star Trek Into Darkness" continues to boldly go where no one has gone before. Download Star Trek Into Darkness from the iTunes Store in Digial HD. 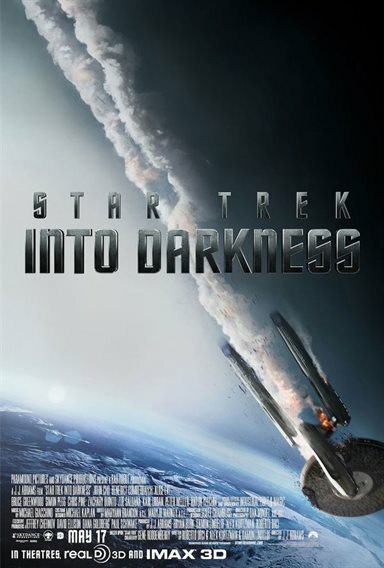 For more information about Star Trek Into Darkness visit the FlickDirect Movie Database.